Madinah airport ... operated by Tibah Airports. Turkish construction firm and airport operator conglomerate TAV Group is in talks with banks to raise a $250-million loan for developing airports in the Saudi Arabian cities of Yanbu and Qassim, said a report citing a top official. In addition, the Turkish group has finalised a deal to buy a major stake in construction conglomerate Saudi Oger, which also operates the kingdom’s Madinah airport, Bloomberg reported, citing its chief executive Sani Sener. 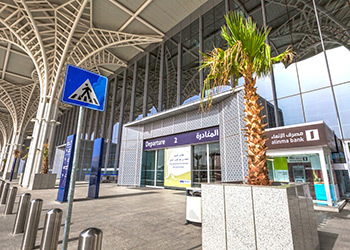 The disposal of the 16.7 per cent stake owned by Saudi Oger, the construction company that belongs to Lebanon’s Hariri family, leaves the ownership of Tibah Airports Development, as the airport operator is known, equally split between TAV and Rajhi Holding Company, the report said. The Turkish group will also bid for the Istanbul unit of Malaysia Airports Holdings if a stake in the operator of Turkey’s second-biggest airport is put up for sale, said Sener. TAV Havalimanlari Holding is “definitely interested” in looking at Istanbul Sabiha Gokcen Airport should requests for proposals be made, he added. Leading Spanish building company Sacyr has completed the development of a semi-urban zone spanning 1.52 million sq m in Bani Hajer area of Al Rayyan governorate in Qatar for €125 million ($139 million). The project, which is the first contract awarded under the Local Roads and Drainage Programme by the Public Works Authority of Qatar (Ashghal), involved the provision of utilities services to more than 660 plots of land, four schools, five mosques and six retail areas, says the company. Furthermore, a 101-km sanitation network was laid and five rainwater run-off tanks were built to prevent flooding, states the company which completed the work in conjunction with Combined Group Company. The project entailed the execution of several roads and streets extending over 29 km, including sections that range in width from 16 to 40 m, with a traffic circle and two signallised intersections. More than 120,000 tonnes of asphalt and 280,000 sq m of paving stones have been used during the construction, according to Sacyr. The Spanish construction giant stresses that despite the fact that the project required more than 8.5 million man-hours, no serious accidents occurred. Sacyr, which also has other projects under way in this country, has included the Middle East among its targets for growth in the construction, industrial and water businesses. It has ongoing projects in Kuwait and Oman, and is also tendering for projects in the UAE and Jordan. Cofely Besix Mannai Facility Management (CBMFM) says it has been awarded a contract by Qatar Foundation to provide maintenance support to all its ‘Group 2’ entities in Qatar. Qatar Foundation for Education, Science and Community Development is a private, non-profit organisation that serves the country’s citizens by supporting and operating programmes in three core mission areas: education, science and research, and community development. As per the five-year contract, CBMFM will be responsible for maintaining more than 25,000 of Qatar Foundation’s assets, which are spread out over 25 facilities across Qatar, consisting of central plant operations, plant rooms, facilities equipment. These also include the iconic Qatar National Convention Centre (QNCC) and the Qatar Science & Technology Park (QSTP), says CBMFM. The Cofely Besix unit points out that a significant number of operational personnel will be deployed for the work. The scope of services includes all corrective, reactive and planned preventative maintenance for a variety of assets such as air-conditioning units, chillers, energy transfer stations, civil works and project-related activities. “We look forward to the various challenges ahead, as the contract highlights our specialist technical capability, as well as our ability to deliver first-class service,” he adds.